Tucker is made of the finest custom-made mohair/wool plush in a warm butterscotch color with airbrushed shading. 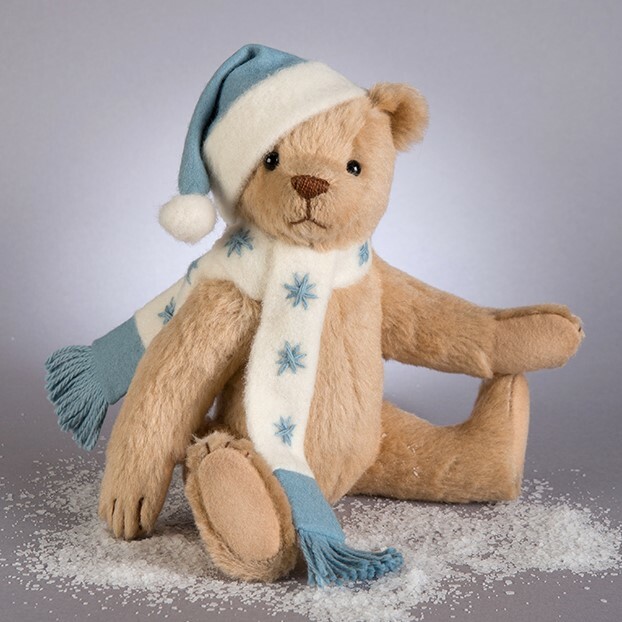 He wears a cosy scarf made of mohair/wool plush and custom-dyed all-wool felt with hand-embroidered wool snowflakes. Atop his head he wears a matching wintertime hat. He is five-way jointed and measures just 10 inches tall standing. Tucker features a hand-embroidered nose and mouth, black glass eyes, and beige all-wool felt paw pads with hand embroidered claws. Tucker is handcrafted at the R. John Wright workshop in Bennington, Vermont in an extremely small edition of just 150 pieces worldwide. Each comes in his own deluxe RJW box with a numbered tag and certificate of authenticity and the forms for owner registration.